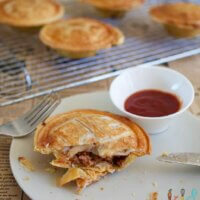 You know, meat pies are considered to be Aussie food. But, shoot me down, I’ve never really liked them. Why? Well… they are kind of mystery food. You never kind of know what’s in them, you never really know exactly what they are going to taste like. For that reason, if I was out, I would always order a chicken, mushroom and leek pie. Mainly because without any detective work…I know what three of the ingredients are. 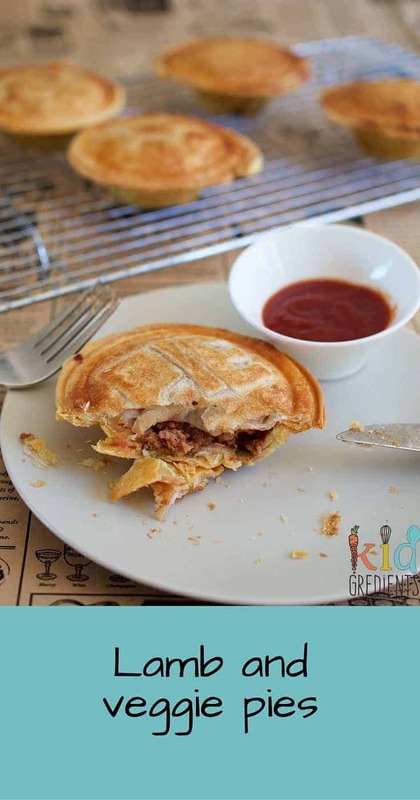 There’s no mystery with these yummy lamb and veggie pies! I’ve told you that Master 3 is currently avoiding green stuff, right? So…you’ll be surprised when I say these were all eaten up, as in completely eaten, green stuff and all. And he has a green stuff radar that is so sensitive he can normally sniff out green stuff, so this is major progress! I did my mince mixture in the slowcooker. But that’s because I’m lazy. You can easily do yours on the stove top. The mixture does however really benefit from cooking long and slow. It means that all the flavours mature and you don’t need to add any nasties. This mixture makes a lot of little pies, at least 20 or you could do a couple of family sized pies (maybe 5) or you could use it for shepherds pie. I’ve made mine with my pie maker, an investment I made last year at kmart that has paid for itself ten thousand times over. The beauty of this $25 wonder machine? You can cook 4 pies at once, no blind baking needed. 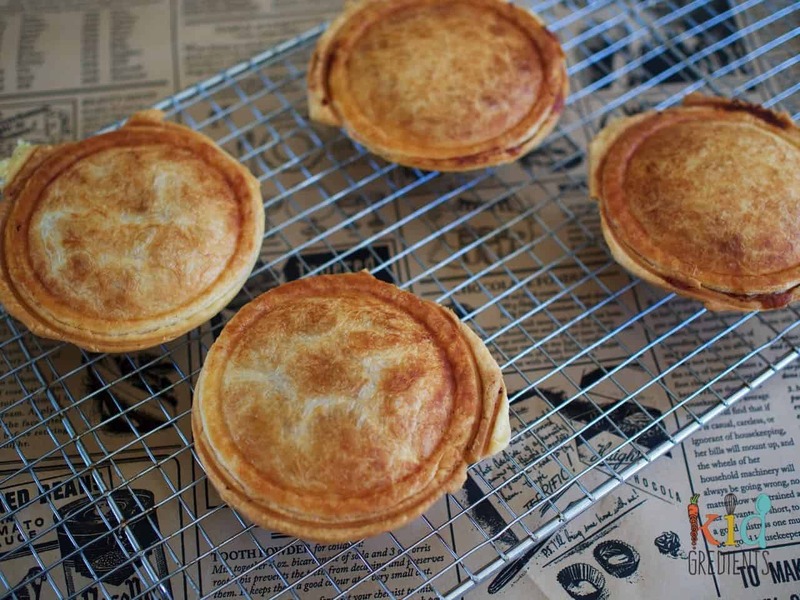 And…if you need an and…you can reheat frozen pies in it, to get them up to the right temp for eating. The pie maker also seals the edges really well together! No soggy bases either. Yummy lamb and veggie pies. Perfect for hiding veggies and so delicious. Options for slow cooker or stovetop and different ways to make your pies! Brown the lamb with the onion and oil in a frypan. Add the mushrooms, carrot and zucchini. Cook for 2-3 minutes. Add the passata, porcini mushrooms. Slowcooker: on low for 5 hours. Add the cornflour to the hot water and mix. Add to the mince and veggies. Stove top: cook on medium heat for 40 minutes. Add the cornflour to the hot water and mix. Add to the mince and veggies. Allow mixture to cool before using in pies. Piemaker: cut the pastry using the guides and line the bases with the shortcrust. Fill the pies with 3 full tbsps of mixture each. Top with the puff pastry circles and brush with milk. Cook for 15 minutes or until pies are golden. Large family pie: line a 24 cm pie plate with shortcurst pastry. Bake blind (filled with baking beans or rice) for 15 minutes at 180 degrees. Fill with the mince fixture, top with the puff pastry and brush with milk. Bake for 30 minutes. 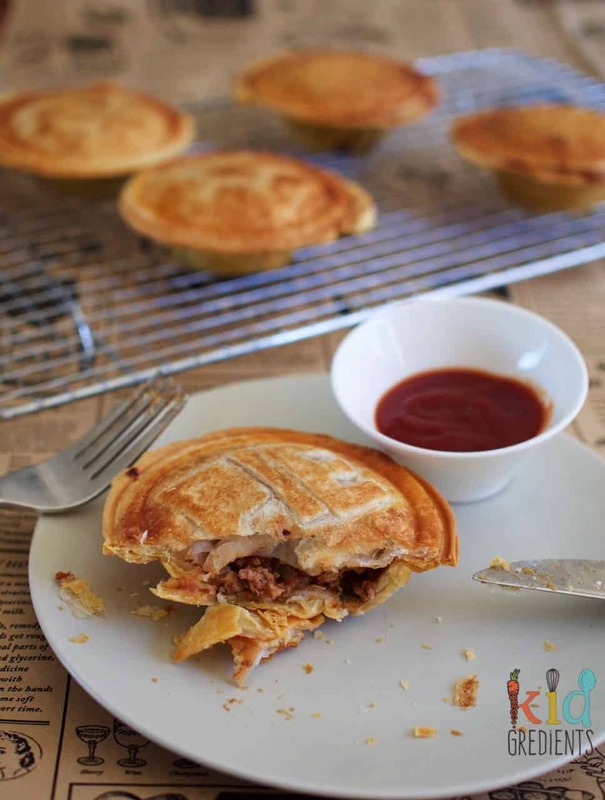 Small pies: freeze well cooked and can be reheated from frozen in the piemaker. It’s pureed tomatoes, sold as passata. Oh lord stop these look amazing! There really is nothing like a home made pie. Thanks Carly! There’s nothing quite like a pie on a wintery night!